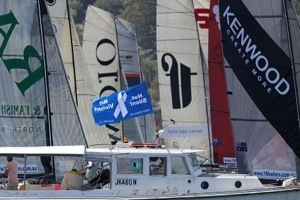 Last Sunday, each team in the Australian 18 Footers League’s 18ft Skiff fleet carried white ribbons on their boats as part of ‘White Ribbon’ campaign day. ‘White Ribbon’ is an organization that works to prevent male violence against women and believes in the capacity of the individual to encourage a change in others. 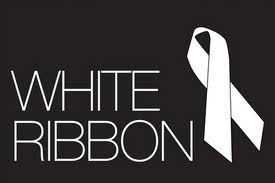 The ‘White Ribbon’ annual campaign seeks to change the attitudes and behavior that leads to violence against women. 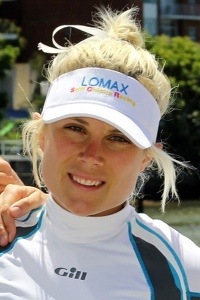 Alexandra (Alex) South, a former world and Australian champion in the Laser Radial class before joining the 18s for this season, approached the League about supporting the campaign. 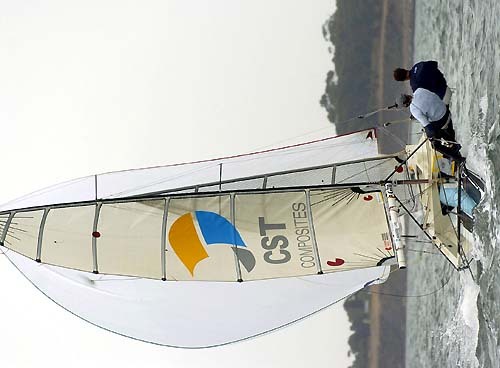 President John Winning and his Australian 18 Footers League team immediately agreed and are totally supportive of the concept and the need to publicly show their support for such a worthy cause. 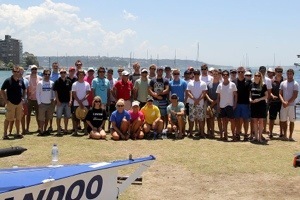 Alex, who skippers Lomax Financial Group, and her ‘Skiff Chicks’ team of Saskia Tidey and Lizzi Rountree, was joined by the male competitors on Sunday to swear the oath before the 18ft Skiffs race on Sydney Harbour. 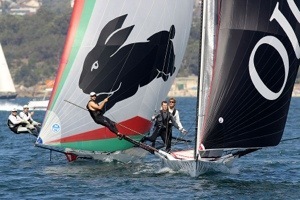 Nineteen of the world’s best skiff teams then made a great display on the harbour as they show their support. 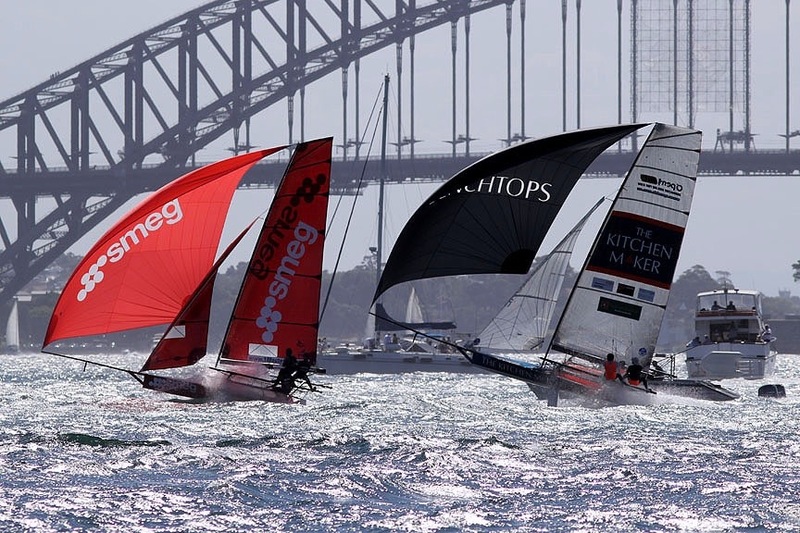 The Asko Appliances team of Marcus Ashley-Jones, Ash Rooklyn and Geronimo Harrison handled the light ENE breeze to perfection to score an easy all-the-way win in Race 6 of the AEG 3-Buoys Challenge on Sydney Harbour today. Always near the lead from the start, Asko Appliances established a big lead at the first windward mark and totally dominated throughout the four-lap course to win by 3m8s. In an extremely tight finish for second place, James Dorron’s Mojo Wine defeated Simon Nearn’s De’Longhi-Rabbitohs by just 9s. Series Leader Pure Blonde (Tom Clout) was fourth, followed by Fisher & Paykel (Andrew Chapman) and Yandoo (John Winning). With just two races left in the Challenge series, and most boats already carrying a maximum points discard, Pure Blonde heads the points table on 23 points. 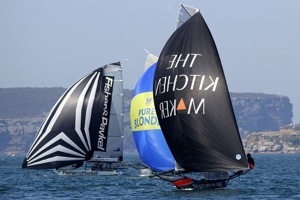 Mojo Wine’s consistency has the team in second place overall on 25 with Thurlow Fisher Lawyers (Michael Coxon) and Fisher & Paykel equal third on 27. 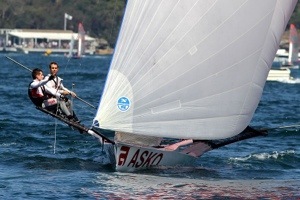 Today’s winner, Asko Appliances is fifth on 31 and backmarker Gotta Love It 7 (Seve Jarvin) sixth on 35. After the strong winds which battered the fleet last Sunday, today’s race was sailed in a breeze which was constantly light from the ENE. With Asko Appliances dominating the race, most interest centred on the battle behind with positions changing from the three buoys handicapping. Former Australian champion James Dorron continues to improve each week in Mojo Wine and was always in the bunch chasing the leader. The Kitchen Maker (James Francis), De’Longhi-Rabbitohs, Pure Blonde, Rabbitohs-Kenwood (Brett Van Munster), Coopers-Rag & Famish Hotel (Jack Macartney) and Thurlow Fisher Lawyers were also prominent at various stages. 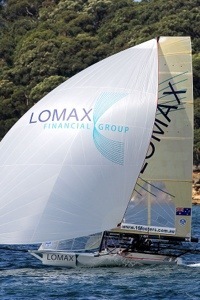 It was also encouraging for the rookie ‘Skiff Chicks’ team on Lomax Financial Group, which finished 13th after carrying their smaller #2 rig in the light conditions. Alexandra South, Saskia Tidey and Lizzi Rountree had the distinction of beating the Gotta Love It 7 team home. 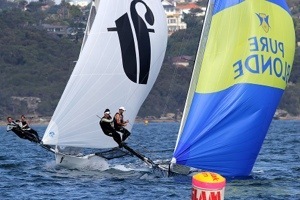 Race 7 of the AEG 3-Buoys Challenge will be sailed next Sunday with the Spectator Ferry leaving Double Bay Public Wharf at 2.15pm. 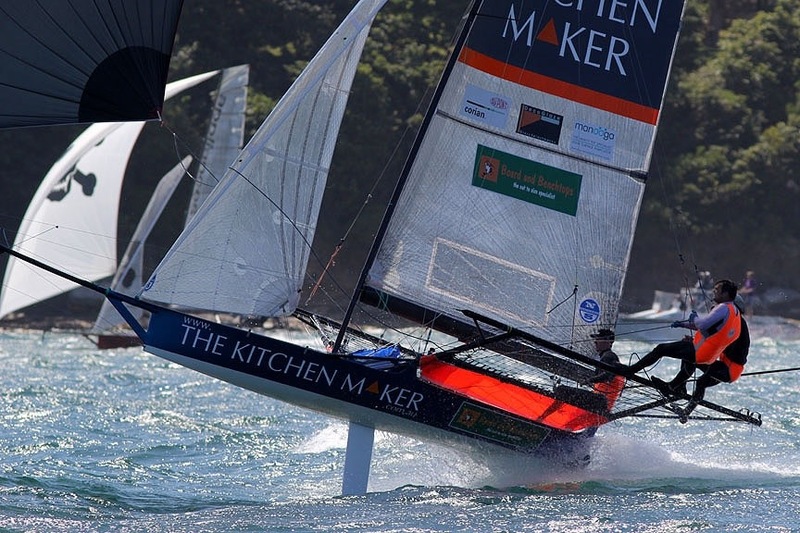 Ben Kelly, owner of the Quantum Sails loft in Brisbane will be racing my 12 foot skiff in the Harsco Infrastructure 53rd 12ft Skiff Interdominion Championship 2013 from 4th to 12th January 2013. Hopefully Ben and John enjoy their rides and have a lot of fun racing against the other Australia and New Zealand teams in Brisbane.